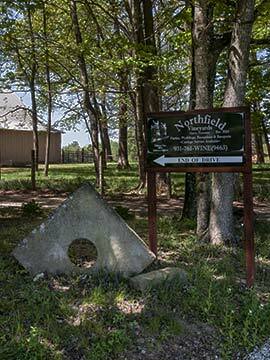 Northfield Vineyards is located on the Ray Family Farm that goes back five generations. The barn that was built in 1904 still stands as a reminder of the days when folks who lived in rural areas lived off the provisions of the farm. The Ray Family Farm tended to milk cows, crops, and tobacco. Today, it's the home of Northfield Vineyards. It's Southern Hospitality at its best at Northfield Vineyards. The country setting with beautiful views is worth the visit all by itself. When you add the friendliness of the Ray Family, you will be glad you came. Bubbly Mule: A sweet sparkling muscadine that is light and refreshing. If you like a Moscato, you are sure to love our Bubbly Mule. Noiret: The Noiret grape was developed and named by Cornell University. This richly colored grape provides a strong flavor for a dry wine that does not have high acidity. Northfield Curve: This is sure to be the customer favorite! It' a combination of our Niagara & Northfield Red! This sweet wine has all the elements wine lover's enjoy! This wine has a romantic attitude and goes great with chocolate! Northfield Red: Here's something you don't find just anywhere at anytime! It's our cranberry wine that blends the perfect amount of tartness with the right amount of sweetness. Ol' Black Izzy: This is a versatile wine that goes great with dinner or dessert. Pairs great with fruit & cheese as well. Our blackberry and Isabella grape blend is sweet and the aroma makes your mouth water. Parched & Pale: An American unoaked Chardonnay. It's a dry white and taste like the grape. No oak or butter found here. RuBark: This Rhubarb wine is different than anything you have ever tasted before. RuBark has its own flavor that starts sweet and finishes on a refreshing tart note. It's light with a subtle sharpness, adding a curl of ginger that will lease the spicy base notes of the rhubarb. Reuben's Red: A wonderful dry red that is sure to make any meal complete.